Words are the most inexhaustible source of magic we have. When I first saw this book, I thought it’s a fairytale retelling of Snow White. However, it’s not a fairytale retelling at all. I’m not really into crime and detective books, but I was intrigued by the premise of this book and I expected it to be good. And it turned out to be awesome. It was action-packed, intense, thrilling and I read it in two sittings. Once when I started reading, I couldn’t put the book down. Why did I think this was a Snow White retelling? Because this trilogy is also known as Snow White trilogy. Why is it called Snow White trilogywhen it’s not a retelling of Snow White? Because the main character is called Lumikki, which in Finish means Snow White. The fun thing is, she doesn’t look like Snow White at all. Isn’t that cool? I absolutely loved the plot in this book. It kept me at the edge of my seat and I just wanted to find out what was going to happen next. I loved these different POVs because we got to see both Lumikki and the ”bad guys”, but it didn’t really spoil anything and it was done very well. It just managed to confuse me even more and I kept flipping pages to see what happens at the end. And except the main mystery about the money and crime, we also find out that something happened Lumikki in the past, but we don’t know what exactly. It’s definitely something dark and unpleasant, but we get to see only snippets from her ”old” life which only made me more curious and I really want to find out what is it that made her who she is. I think it’s really cool how past and present intertwine throughout the whole book and even though one mystery is solved at the end, there are so many more questions left unanswered and it makes me want to pick up the second book immediately. I really liked Lumikki. 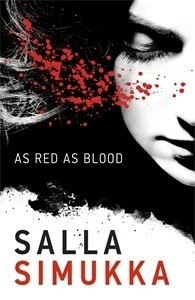 She was fantastic protagonist and this book was so awesome mostly because of her. She was very unique and very different from any other female character I’ve ever read about. She was strong, determined and even though she went through a lot, she stayed cold-headed and brave. All these little details we find out about her through the book were just building one on top of another until we could picture her character and what she may have been through. I could also relate to her and I found out that we are very simmilar in some ways, but completely different in others. Elisa was my second favourite character. At the beginning she seemed like another shallow popular pretty girl, but toward the end of the book, she went through huge character development and I ended up really liking her. She practically grew up in these five days when book takes place. Terho was probably my least favourite character and he wasn’t even the biggest criminal and bad guy out of all of them. I just hated the guy. He was selfish, stupid but tried to be presented as a good guy who found himself in something bad. Well, I don’t buy it. It was his decision and he should’ve think about concequences before. Idiot. I actually didn’t like the writting style very much. I found it a bit amateur and not very special, but it’s a possibility that this is because of translation (the book is originally written in Finish, then translated to English, and then my copy also from English to Croatian) so I wouldn’t be surprised if the writing style got lost in the process. However, I didn’t care much about that because the plot itself was interesting enough. There were some beautiful quotes as well, and this book had some awesome creepy atmosphere. I could easily get into it and finish it in no time. I would definitely recommend this book to you if you haven’t read it yet. I know that I’ll be reading the next book very soon because I need answers!